A song dedicated to the victims of the 2014 Sewol ferry tragedy that left 304 dead was released Thursday. The song title roughly translates to “To Touch My Longing (for You)” -- and sings about the devastation of losing someone dear to you in a calm demeanor. On April 16, 2014, the Sewol sank off the country’s southwestern coast in one of the worst maritime disasters in Korea. Most of the victims were students from Danwon High School on their way to Jeju Island for a field trip. Songwriter and producer Kim Hyung-suk -- who wrote the song with Hado -- plays the piano alongside the vocals of singer Na Yoon-kwon. Kim said he has been working on the song since the ferry went down, and wrote the words for it when the ship was finally salvaged from beneath the depths late last month. “Ever since the Sewol tragedy, the month of April has become a cruel one. I’ve made the song in memory of the children,” he said. Moon Jae-in, the presidential candidate from the Democratic Party of Korea, provided narration for the song, which is included in the music video version released via YouTube but not in the officially released audio version of the song. “They’re not someone else’s daughter, they’re my child,” he said. When asked to say something to “Da-hye,” he refused to do so. In the narration, he called out the names of the nine victims whose bodies are still unaccounted for. This included four students from Danwon -- Jo Eun-wha, Heo Da-yun, Nam Hyeon-cheol and Park Young-in -- and 6-year-old Kwon Hyeok-gyu. The video was posted on Moon’s official social media pages and YouTube account. 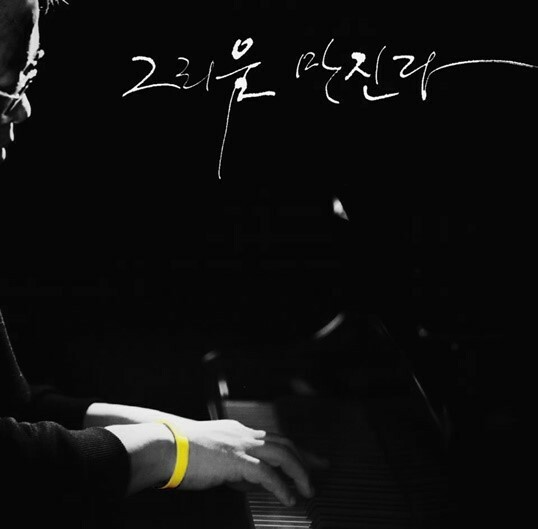 All profits from the song will be donated to the bereaved families of the Sewol tragedy.